Celestial Heavens - An active community site with guides, walkthroughs and more. 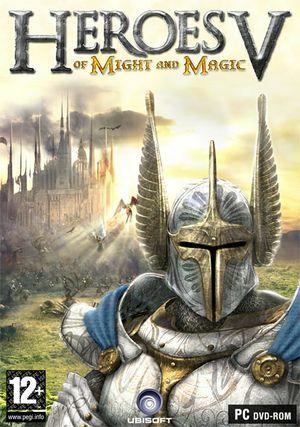 A standalone expansion, Heroes of Might and Magic V: Tribes of the East, is also available. Latest version is 1.6. The Steam version is already patched. 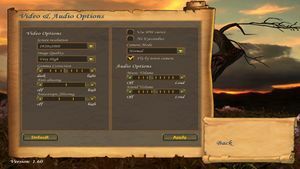 Up to 8x through options menu. 16x can be forced through graphics card control panel. On by default. To turn it off, use the "setvar gfx_vsync" variable under "user.cfg". Retail only, but language files available. Official localization. Local retail version and GOG version. ↑ 1.0 1.1 File/folder structure within this directory reflects the path(s) listed for Windows and/or Steam game data (use Wine regedit to access Windows registry paths). Games with Steam Cloud support may store data in ~/.steam/steam/userdata/<user-id>/15170/ in addition to or instead of this directory. The app ID (15170) may differ in some cases. Treat backslashes as forward slashes. See the glossary page for details.